Submitted Photo Scholarship winners include, Left to Right: Mikhaila Roe, Samantha McLaughlin, Hannah Heimbach, Devon Crisp. The 86th celebration of Minford Alumni was held May 23, 2015 at Minford High School with 250 alumni and guest in attendance. Alumni traveled from 12 states to attend the event. The Pledge of Allegiance was led by Mikhaila Roe, a graduating senior. Our national anthem was sung by Simon Thoroughman, a member of the sophomore class. The invocation was given by Mike Gampp, a member of the Class of 1965. President Lynn Wessel and Toastmaster Carrie Roe presided over the evenings events. Four $1,000 scholarships were presented to seniors from the Class of 2015. 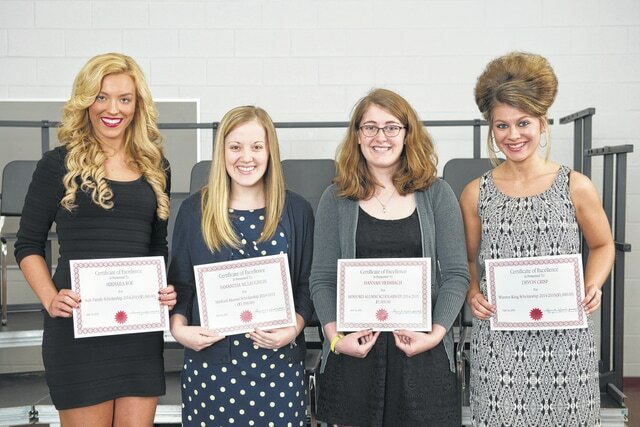 Samantha McLaughlin and Hannah Heimbach were presented with $1000 alumni scholarships. Funding for these scholarships is provided through alumni donations and business advertising sponsorships. Two scholarships were also given by families as a memorial for a family member. Devon Crisp was awarded the King -Warren Memorial Scholarship for $1000. The Katherine Ault Memorial Scholarship for $1000 was presented to Mikhaila Roe. The Distinguished Service Award is given to a Minford graduate who has made a significant contribution to their profession or field of expertise. Lori Burchett Seibert, a 1975 graduate was presented this award for her work in the field of radiologic technology. She is employed by Toshiba America Medical Systems in California She has traveled to 46 states and the Dominican Republic teaching the latest CT techniques. She also teaches at veterinary colleges in their use of CT scanning. The Hall of Fame Award is an award given to an outstanding individual who has made a contribution to the Minford Schools or the community. This year’s Hall of Fame Award recipient was Tim Martin. He was recognized for his dedication and tireless hours spent working with our area youth as a coach, a mentor, and a church youth leader. His coaching has resulting in many winning seasons, over 300 wins, 11 sectional championships, 2 district titles, and helping nearly 40 players reach their goal of playing at the college level with a few progressing to a professional level. Prior to coaching, he had much athletic success of his own. As a 1983 graduate he lettered in football, basketball, and baseball. After high school he was signed by the Pittsburgh Pirates and spent three years in the minor leagues as a pitcher until sustaining an injury to his pitching arm. The Alumni Association has three awards that may be given to recipients names are submitted to the committee. The Memorial Award was not given this year, and the Alumni committee is seeking nominations for these awards that may be presented at the 2016 banquet. If anyone would like to place a name for an award, contact any alumni officer before March 2016. Officers from the 2015 alumni banquet are President Carrie Roe, Toastmaster Kathy Howard, Secretary Treasurer Joe Stockham, Alumni Affairs Director Steve Crabtree and Public Relations Director Mary Conklin.